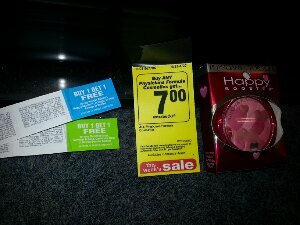 Thursday at CVS we got some great deals! 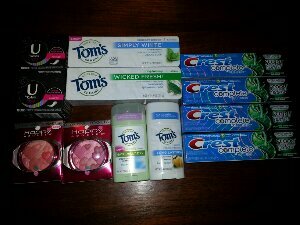 I was especially excited about the free Crest toothpaste that B uses and the discounted Tom’s of Maine toothpaste and deodorant that I use. My sister was also able to get a great deal on the Physician’s Formula blush she uses every day (See below pic). Note- These are not that cheap but they are all Natural and sustainable. Physician’s Formula was a great deal this week. My sister had B1G1 free coupons that she found on some Physician’s Formula products at Target and she combined them with the $7 CVS extracare bucks for a really great deal. 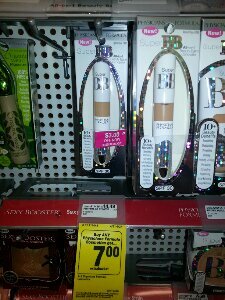 In addition there was a $2 off of $10 beauty purchase coupon printing at the CVS red coupon machine that would also add to this deal. The Physician’s Formula BB cream also had $3 off coupons attached which was also a great deal but we don’t use this so we didn’t buy it. Note- Today is Saturday as I post this so this is the last day for these deals. However, CVS runs this Physician’s Formula sale frequently.